Grant Fuhr/ Bill Ranford. 2006-07 Artifacts Tundra Tandems. card number: FR. THE CARDS NUMBER IS 13. THE GRADER IS SPORTSARD GUARANTY (SGC). THE CARDS FINAL GRADE IS MINT SGC 96 = 9. 1995 Upper Deck Bill Ranford #16 Oilers "AUTOGRAPHED" Hockey Card WL6. INCLUDED IN THIS LOT ARE;. All the cards are in nrmt-mint condition with/95% MINT! There is NO DUPLICATES! (1) 1991-92 Pinnacle B Inserts #B7 - Bill Ranford. It is professionally graded Mint 9 by BGS. ( 9504123). 9.5 - Surface. 9 - Edges. 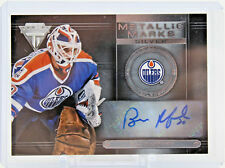 Certified autograph of Edmonton Oilers legendary goalie. A mini SEALED Bill Ranford mini stick IN BAG. I took one out of bag to take picture and show what it looks like. This stick is serial numbered our of 7500. This is the 7th different mini stick the Oilers have made over the past 5 years. THE CARD IS IN NM CONDITION FOR THE YEAR. NICE COLOR AND CENTERING FOR THE YEAR. BACK IS VERY NICE. 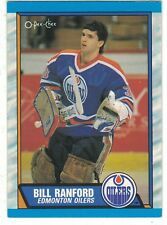 2014/15 UD Artifacts Edmonton Oilers Bill Ranford card #105. Limited #210/999. I got a shirt signed, so I asked for this card too, but the card is NOT signed. Super limited.1 hour availablity. 1995 Upper Deck Be A Player Bill Ranford AUTOGRAPH Card #16 Oilers, Bruins, Capitals, Lightning, Red Wings. You are purchasing a complete team set of Edmonton Oilers from the 1993-94 Parkhurst by Upper Deck Hockey 540-card set. The set was produced in two series and sets were hand-collated. The complete team set includes the Parkhurst Prospects (PKP) Sensational Sophomores (SPH) and rookie (RC) cards when applicable.